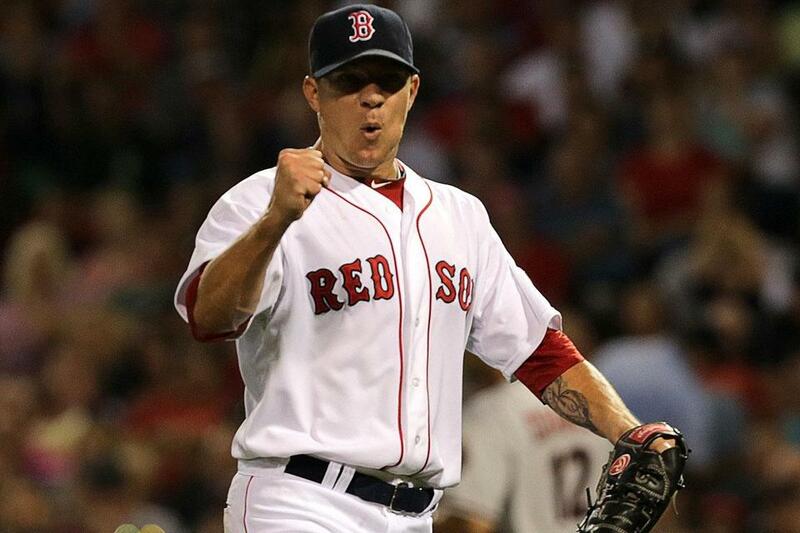 Jake Peavy was pumped for his Red Sox debut, pitching into the eighth inning and allowing only two runs. His first start with the Red Sox was still 24 hours away, but Jake Peavy was already doing advance work. Peavy talked with Juan Nieves, a voice he trusted after spending four years together with the Chicago White Sox. He traded notes with catcher Jarrod Saltalamacchia to make sure they would be on the same page. They sit about four lockers apart in the clubhouse. They talked for close to a half-hour. Saltalamacchia got a feel for Peavy’s likes and dislikes. Peavy gave him an idea of what made him tick. Then, he did his homework, studying the Diamondbacks lineup top to bottom. While Jon Lester was on the mound Friday, Peavy was in the clubhouse, charting pitches. He had earned more wins against the Diamondbacks than any other team in the majors, but this was his first appearance for the Red Sox. He made sure there were as few surprises as possible. Buoyed by Peavy’s seven-plus innings of four-hit pitching, the Red Sox defeated the Diamondbacks, 5-2, before a full house at Fenway. Peavy (9-4) walked two and struck out seven and left to a standing ovation when he was lifted in the eighth inning after 99 pitches. He used his entire arsenal — fastball, curveball, cutter, change — to ring up seven strikeouts. Even as the Diamondbacks’ young All-Star Patrick Corbin muzzled the Red Sox lineup, leaning on his slider to strike out six, Peavy battled him pitch for pitch. They both gave up solo homers, Peavy to Paul Goldschmidt in the fourth, Corbin to Shane Victorino in the fifth. Corbin finally faltered in the seventh, giving up singles to Stephen Drew and Brandon Snyder to start the inning, then got knocked out by an RBI single from Jacoby Ellsbury that gave the Sox the lead. The single extended Ellsbury’s hit streak to nine games. Will Harris came in but Victorino delivered a sacrifice fly to center for a 3-1 lead. Coming in, Corbin was 12-2 with a 2.24 ERA. All but three of the lefthander’s 21 starts were quality starts and the Diamondbacks were 18-3 when he took the mound. But Peavy, looking to make a strong first impression, was prepared for a pitcher’s duel. On the mound, Peavy was in his own universe, living and dying with every pitch. His internal monologue was on display for everyone to see. He fussed at himself after pitches — even the good ones. The Sox supplied just enough offense. Corbin allowed a career-high four hits to lefthanded-hitting batters (Victorino two, Ellsbury and David Ortiz one each). Even though it looked shaky initially, the Sox bullpen made sure the Diamondbacks didn’t spoil Peavy’s outing. Craig Breslow came on and hit the first batter he faced, Cliff Pennington, and then gave up a single to Gerardo Parra to load the bases. When Farrell came out to take the ball from him, Breslow left without recording an out for just the second time this season. The cleanup job fell to Junichi Tazawa. Aaron Hill shot his first pitch to left field, scoring Wil Nieves, but Jonny Gomes gunned down Pennington at the plate to prevent the tying run from scoring. From there, Tazawa stomped out the fire, fanning Goldschmidt with a 95 mile-per-hour fastball and getting Eric Chavez to sky out to Gomes. The insurance came in the eighth, when Saltalamacchia smacked a two-run homer to center field, his 10th of the season and his second in four games. Koji Uehara closed the door, making his 10th straight scoreless appearance to record his 10th save of the season. Looking back, Farrell said, it probably came an inning earlier. “Koji gets credited for the save, but the throw from left field [by Gomes] might have been the save,” Farrell said. Peavy came out for the eighth, but threw just two pitches. The first was slider that kissed the inside edge of the strike zone. The second was another slider that strayed off the corner low and away, but that didn’t stop Nieves from chasing after it. When Nieves shot it to center field on a zipline, Peavy’s night was done. He took slow strides to his new dugout, the volume of the cheers increasing with each step. He had introduced himself with a long night’s work on the mound. His new fan base was pleased to meet him. As grateful as he felt, his mind was still on the field. Still, he said, it was special. It was his 296th career start, but this was a new beginning.